Gordon Walker always wanted a house in the mountains with a view of the water. A well-traveled businessman originally from Minnesota, the former president of firearms producer Colt’s Manufacturing Co. had called cities such as Chicago, New York and Geneva home during his lifetime. He had also enjoyed a vacation villa in Spain. But Gordon knew he had found the perfect place to build his dream retirement home when family friends introduced him to Sun Valley, Idaho, because of his love for hunting, fishing and entertaining, “Dad loved the outdoors, being in the mountains, the sun and the water. I remember one summer spending six weeks driving to Alaska and back with him, camping and fishing along the way,” recalls his son, Gordon Walker Jr. 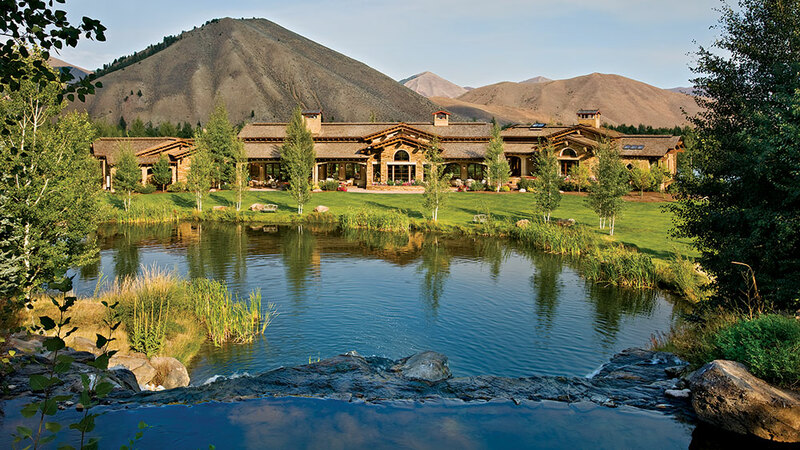 The 9,844-square-foot home in Sun Valley’s Golden Eagle subdivision, a mile from the town of Ketchum, Idaho, began construction in 2003 and took 16 months to complete. “Dad was really hands on. He put his heart and soul into the place. It was part and parcel of who he was,” explains Gordon Jr. Designed by Idaho architect Jeff Williams, the four-bedroom, five-and-two-half-bathroom house embodied Gordon’s hospitable personality with lots of space to gather friends, tell stories and display his extensive art collection. “The bar was the heart of the house,” recalls his son. Influenced by his time in Spain, Gordon loved delicate, light Mediterranean architecture, but the architect convinced him the Idaho landscape suited a design with an earthier toughness. Dark timbers, stucco and rock were chosen for the exterior. The architect designed the backside of the house to face the waterfall and added outdoor terraces, an outside fireplace, a built-in barbecue and gas heaters in the terrace ceilings, allowing Gordon to prolong his al fresco parties when the nights got chillier. Gordon Walker Sr. may be gone, but thanks to his family, his dream lives on. Sightlines from the entrance guide visitors straight through the living room, past the bar and through the window to a waterfall. Skylights ensure an open, airy feel, and the steps down to the living room and bar keep the view prominent. Gordon Walker Sr.
loved to play bartender and regale his guests with jokes and stories while they enjoyed gazing at the view. 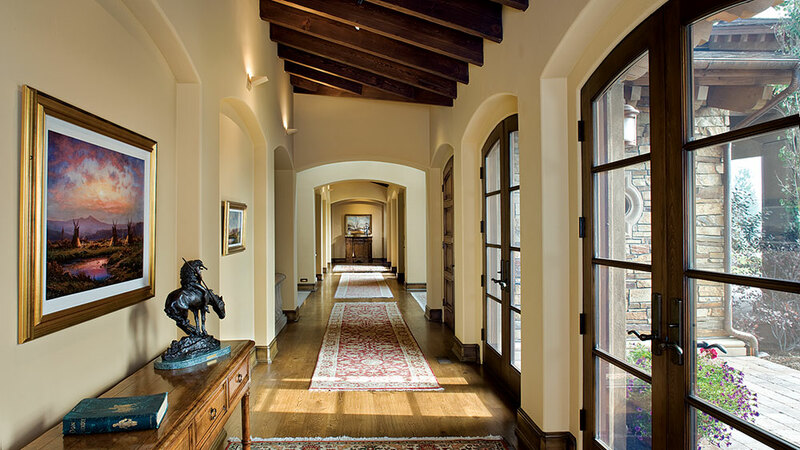 The beamed ceiling, arches, columns and banisters give the dining room a Spanish mission look. The kitchen and family room are separated by an island. “We use the family room a lot; it’s a popular sitting area, and we also like to eat our meals at the dining table in here, which seats six,” says Gordon Walker Jr. Skylights bathe the space in light during the day, and in the evening, track and pot lights add ambience. “The painting on the far wall is called ‘The Sharpshooter’ and was commissioned when Dad was at Colt. There’s a matching sculpture below,” he notes. The master bedroom is on the southwest side of house with a view of the waterfall through the glass. 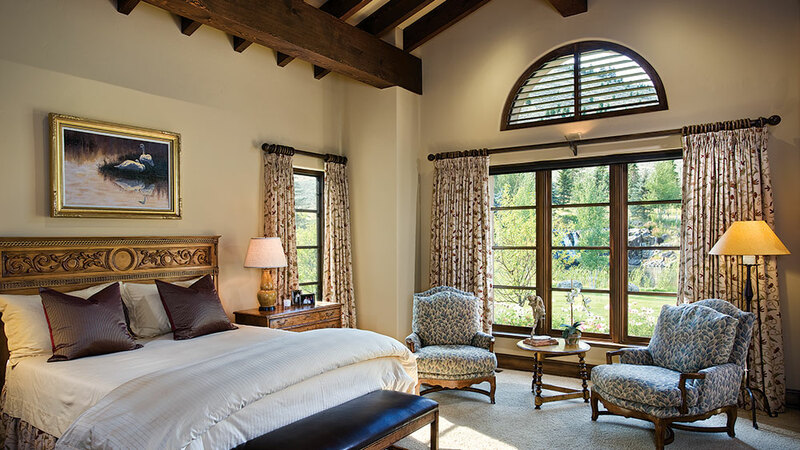 Spacious and comfortable, it features exposed beams and custom blinds in the half-moon window. “The decor reflects Dad. It’s masculine, and the furniture is on a big scale to match the scale of the home,” explains Gordon Jr. The ensuite guest bathroom is the best one in the house, says Gordon Jr. The bathroom faces east, is tiled with marble and travertine, and has a separate shower. “The view of the mountains is spectacular from the tub,” he notes. There are four covered patio sections at the rear of the house with plenty of room for outdoor entertaining. 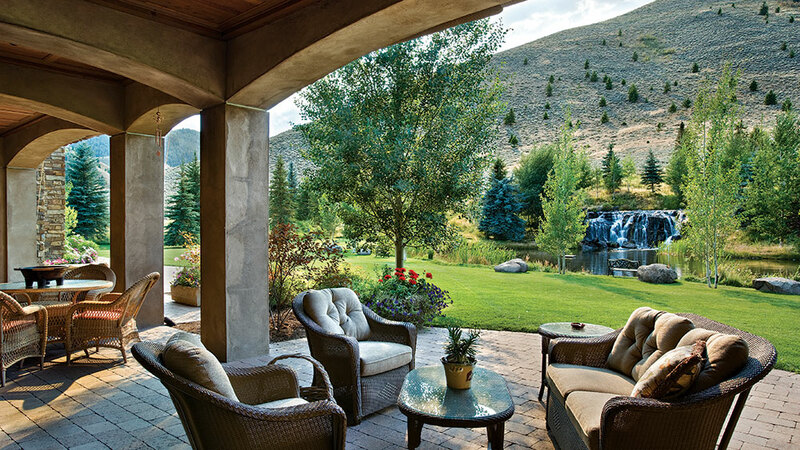 A fireplace and outdoor radiant heating units installed in the ceiling allow the Walkers to keep their guests pleasantly warm, even on cool Idaho evenings.